We made the most simple and easy soup last night for dinner. It was actually the perfect meal because it fed everyone in my house, from husband to toddler to baby. Ok, well, the baby not yet (she’s almost 5 months old and hasn’t started solids. I can’t wait until she does. Not only because I’m excited to try out real food with her, but also because I’ll have lots more material to blog about, ha!). Anyway, we picked some corn the other day and I decided to make a dish that both my mom and her sister (my aunt) used to make: corn soup. 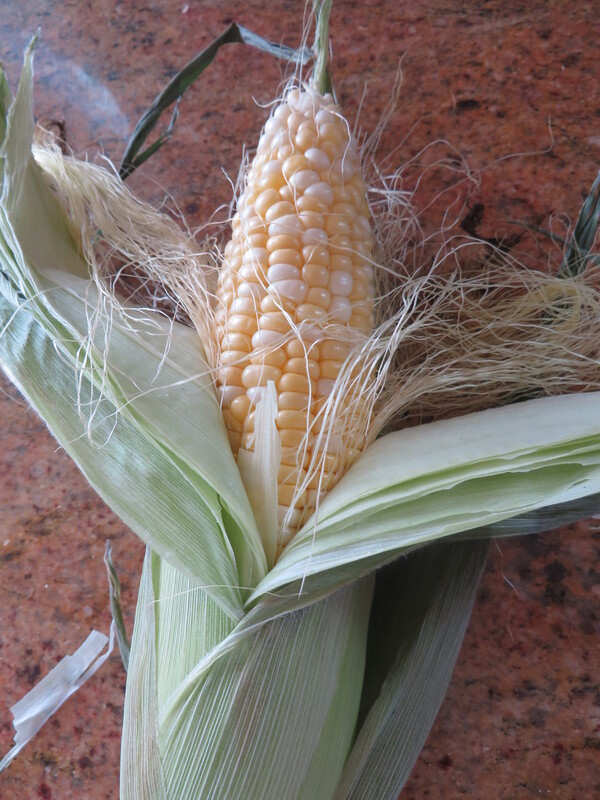 It’s nothing fussy or fancy and it’s not a chowder, but it’s the most fabulous tasting soup for a corn lover. 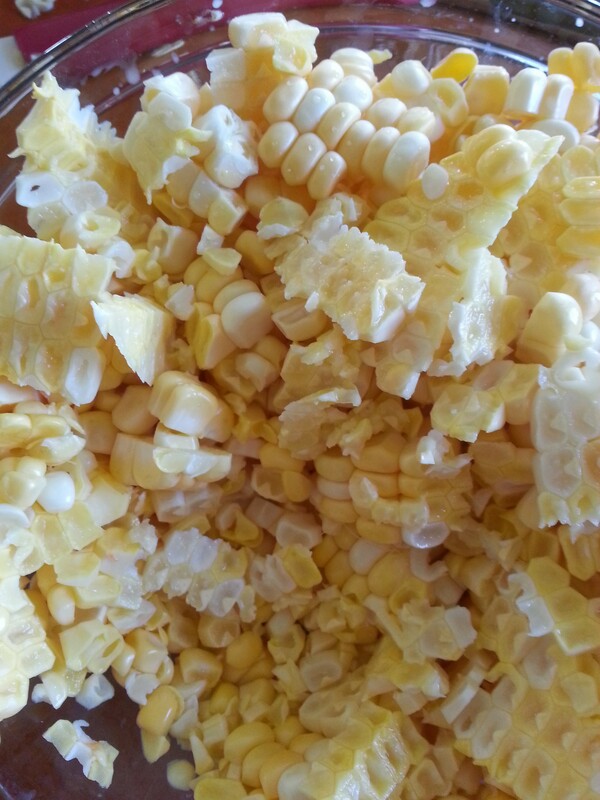 The recipe has just the right balance of seasoning–not too overpowering that it takes away from the corn. My aunt first made this dish when she was visiting from India. My mom was pretty ill at the time and my aunt came to stay with us for awhile. One night, when we were thinking of what to make for dinner, something not complicated and not Indian, but still comforting, my aunt came up with this corn soup. It was refreshing because of its bright flavors. To this day it reminds me of my mom and aunt, and how wonderful their cooking hands were/are. The original recipe simply calls for carrots, onions, corn, salt, pepper and cooking liquid (milk or water). My recipe variations: I added 2 stalks of chopped celery, swapped the white onion for some scallions and added a few chopped up basil leaves. Flavor twist! 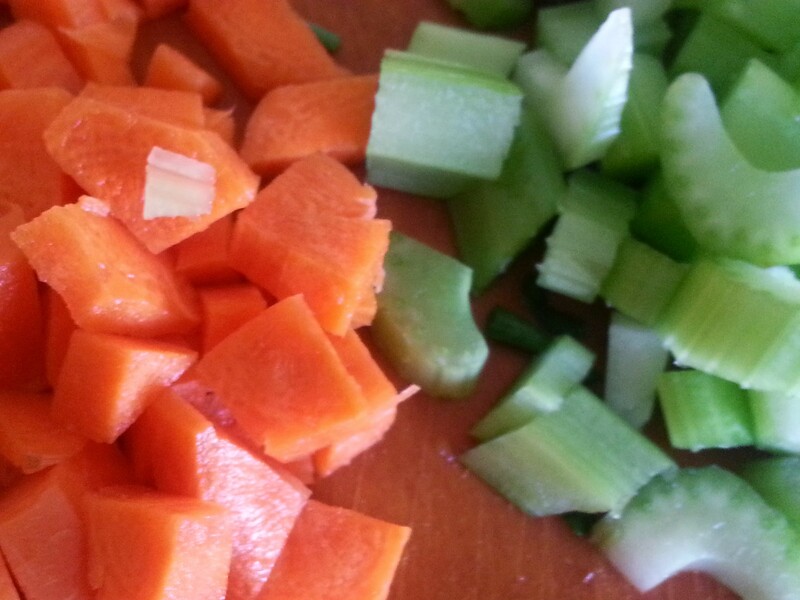 Diced carrot & celery…soup base must! 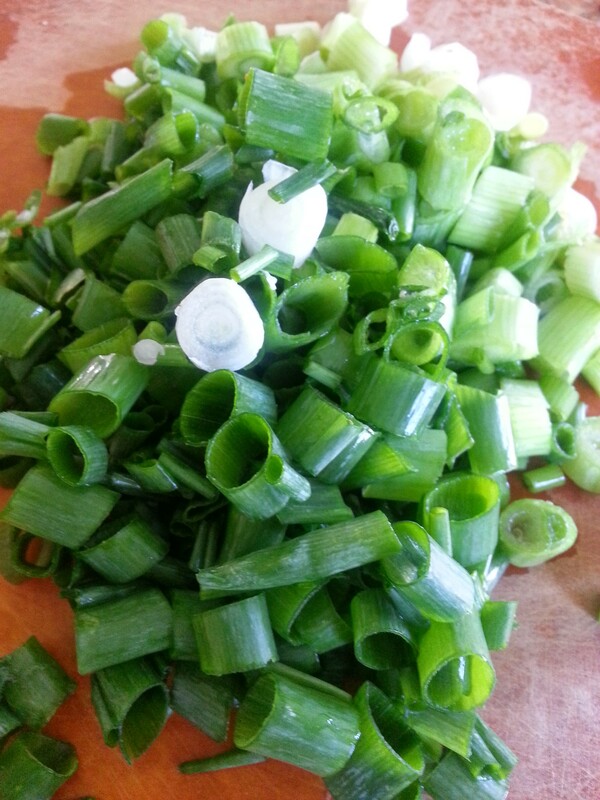 Scallions impart a unique onion flavor to recipes. Simply summer. 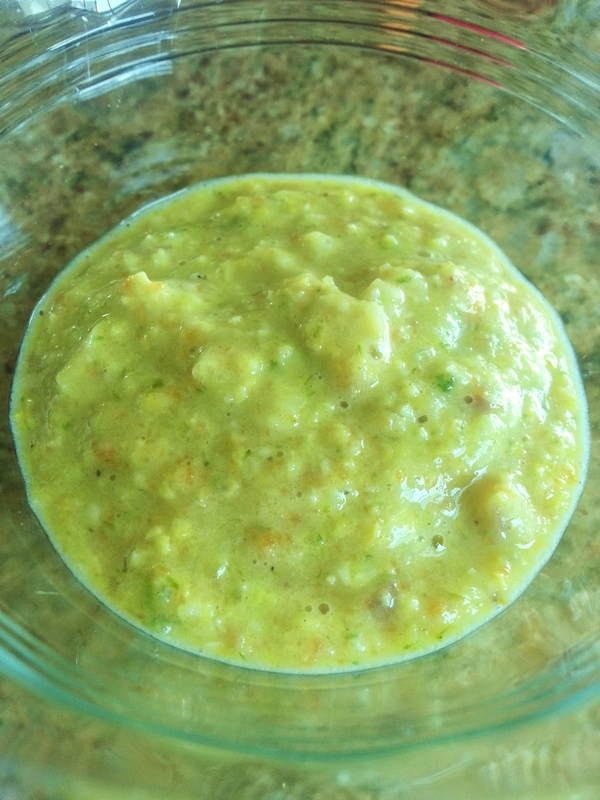 You can serve it hot off the stove for an adult or toddler, or blend it into a smooth, well-seasoned puree for baby. The whole family gets to eat together and, most importantly, eat the same thing. The last thing you want to do is become a short-order cook and make separate meals for separate members of the household. Also, the addition of basil is exciting for baby in particular. You can try lots of other herbs with this recipe…try oregano or cilantro for some variation. Each herb will provide a different flavor profile for baby. As always, start gradually! This particular puree is good for the 8-month-old and above crowd. Cooking liquid (can use water, broth or milk. remember cow’s milk is usually for babies over the age of 1). 1. Coat pot with a thin layer of butter an/or cooking oil. Add carrots, celery and scallions. Add a pinch of salt. Sautee for 7-10 minutes, until soft. 2. Add minced garlic and sautee for 2-3 minutes, until the raw smell dissipates from the garlic. 3. Add corn and sautee for 2-3 minutes. 4. Add enough cooking liquid to cover vegetables. Bring to a boil. Once boiling, reduce and simmer for 20 minutes. 5. Add herbs and cover pot. Let sit for 5 minutes to allow flavors to permeate the soup. Add salt and pepper to taste. 6. To serve: Keep as is for adults. You can blend a few cups of the soup in a blender and add it back into the pot for a thicker texture. For baby, puree in blender and serve warm or cold. I served this with grilled cheese sandwiches (Swiss cheese on challah bread to be exact). What a great family meal! I am going to try this again in a few months so baby Ela can really take part. Kirina had plenty of fun with it. My writing is so scattered today! So goes life with two children under the age of 3. 🙂 Feel free to e-mail me or comment if you have questions.